I couldn’t track as to why the original recipe is called Hawaiian oxtail soup. I gather it’s because it has a combination of different Asian flavors that can’t be defined as coming from one country. I liked that; it’s a mutt of a soup! 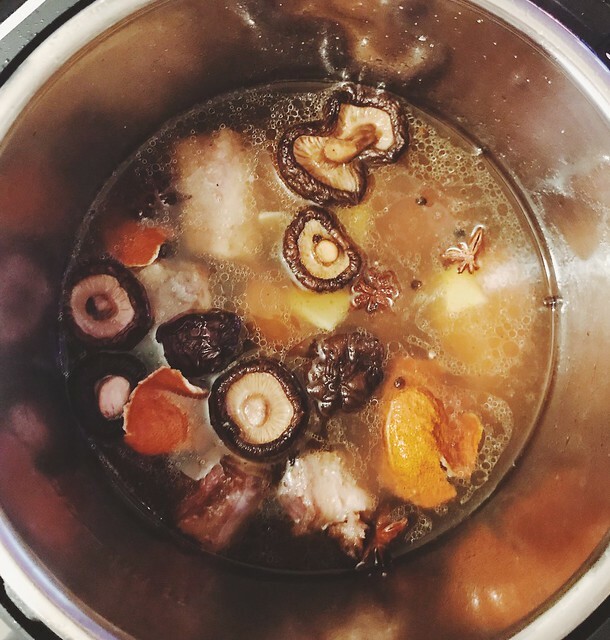 I love the base broth of this recipe. 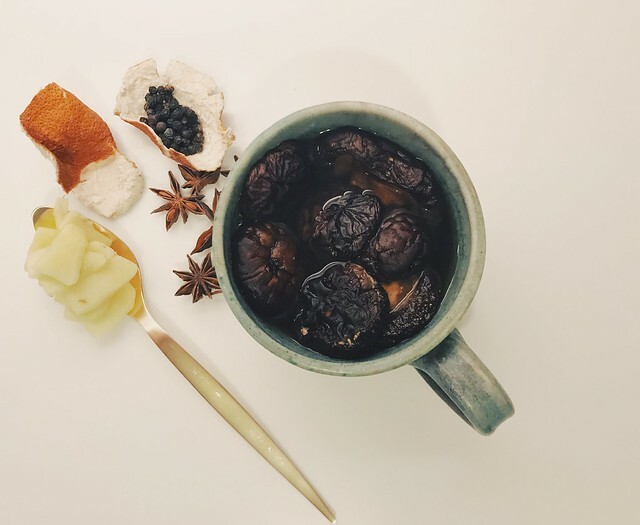 It reminded me of a Taiwanese stew that uses star anise and dried tangerine peels. If you cook enough Asian food, it’s worth drying some tangerine peels when you buy and eat the fruit—they keep for a long time in a sealed jar. If you don’t have them dried, feel free to use fresh ones, just make sure you remove most of the pith. The dried shiitakes remind me of Japanese-style hot pot, while the fish sauce, the lime, and cilantro give it a Vietnamese flavor. And perhaps the ginger is a nod to Shanghai. Look how pretty everything was before I pressurized it. The oxtail gave this soup the body it needed, so I only strained it haphazardly. I figured that the bitterness of the mustard greens will hold off a lot of the fat back and I was right. You can use Swiss chard too, and in a pinch, spinach. After all, mutts are forgiving. 1. Soak the shiitake mushrooms in a small bowl filled with hot water. Set aside. 2. Using the sauté function of your Instant Pot, add oil and sear the oxtails until evenly browned on all sides. Then add the rest of the soup broth ingredients, plus the shiitakes and water. Add a little more water just to make sure the oxtails are somewhat submerged. 3. Cover and lock the lid properly. Select the Pressure Cook function for 45 minutes. When it’s done, do a quick release after venting and letting the steam out. 4. Using a spider strainer or a slotted spoon, remove all the solids into a large bowl, and strain the broth into another. Return the strained broth to the Instant Pot and turn on the sauté function again. Add the mustard greens and cook for a minute and season the broth with a jigger or two of fish sauce. 5. 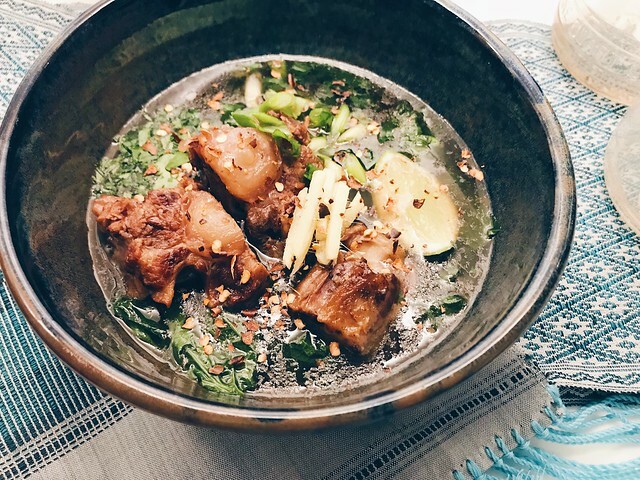 To serve, divide the oxtails into your soup bowls, and discard the remaining ingredients. Ladle in the seasoned broth into each and garnish with ginger, cilantro, scallions, red chile flakes, lime, and sprinkle with salt. I have the Instant Pot DUO60 6 Quart but this is a similar model, just pricier!